Located directly on the Coosawattee River, you'll love the calming sound of the river both day and night. The last 1/2 mile of roads to the cabin are gravel, so even though you're only an hour or so north of the city, you'll feel a world away from life's 'normal' stress. There is a large covered porch with ceiling fans and plenty of seating, including a log swing. Enjoy meals on the huge screened in porch while being entertained by the abundant wildlife both in the wooded yard and in the river. It's not uncommon to see deer playing in the river or crossing through the yard. Let your relaxation continue as you build your own campfire by the river. Terrace level patio features a 6-person hot tub - perfect way to end an evening if you choose. Main floor features a living room with a gas fireplace and a 55-inch TV. Kitchen with plenty of counter space and stainless steel appliances is stocked with all the culinary tools you'll need - coffee maker, pots and pans, cutlery, bottle opener, etc. Large Master bedroom features King log bed with high-quality mattress for a perfect night's sleep. Master Bath has whirlpool bath and separate shower. 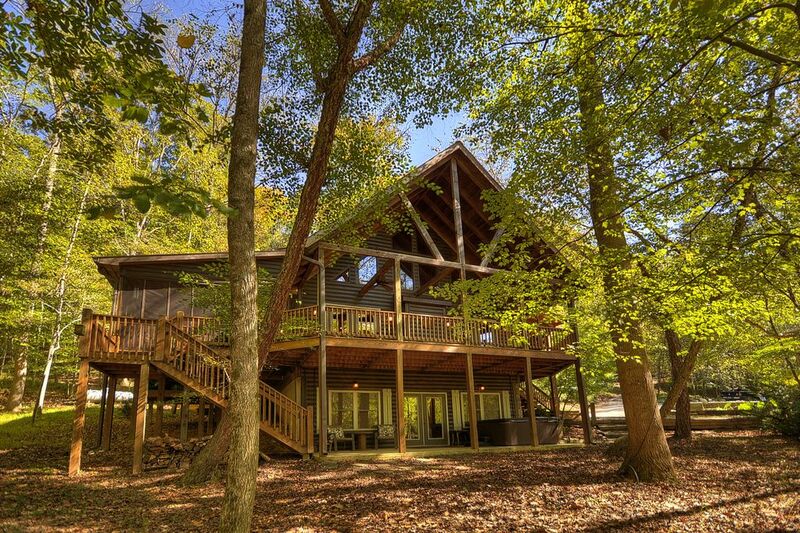 Upper level has loft area and second Master bedroom which also has King size log bed. Walk out of this bedroom onto a small private covered porch. Terrace level is the 'fun' zone, featuring a large seating area with 55 inch TV, board games, puzzles and books. There is also a full-sized ping pong table (with paddles and balls) if you're feeling competitive. Bedroom with 2 Twin log beds connects to full bathroom with washer/dryer. Direct access to the Coosawattee River with 200 feet of river frontage. Dining area off kitchen has bar-height table with 2 drop leaves and can seat up to 6. Rectangular wood table on screened in porch can comfortably seat 6. This rental was absolutely perfect for our family. The decor is top-notch, and the river view (and sound) is amazing. We especially enjoyed the ping pong table and game room area downstairs. We would love to stay here again in the future. This is a beautiful place and the owners are very responsive. This property has everything you need for a nice getaway! This cabin is EVERYTHING. PERFECT for the most perfect scenic family getaway. That. River. View. !!! Even more amazing in person than I thought. Perfect interior too. Charm charm charm. The accommodations were well maintained and wonderfully decorated for the holidays. We enjoyed the amenities of the interior and the views and sounds of the rushing river from the decks. The surrounding area offered pleasant varieties such as the river, mountains, close to town for shopping and restaurants. We would visit again. Thank you!